Grace, Objects & Raffle: Alan Harris. Menu: Salmon en croute/Aubergine, spinach & feta Quiche. 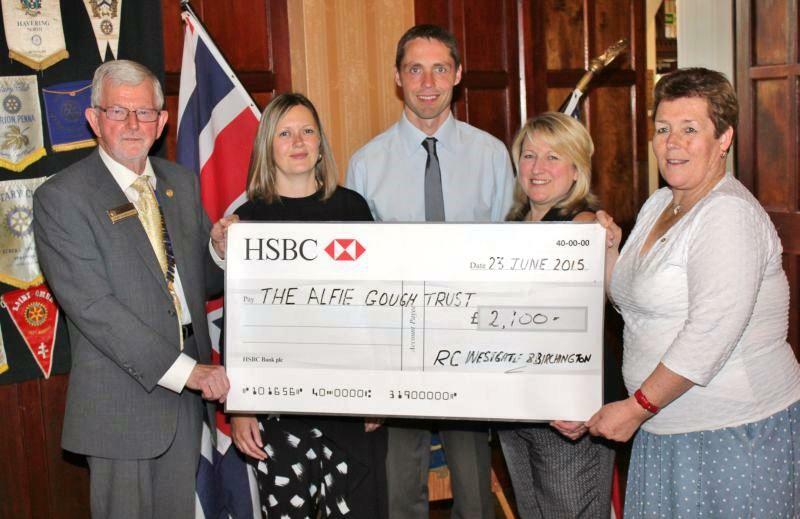 A large donation of funds raised at the recent "Strictly Come Rotary" dance competition was handed over to Dean & Sarah Gough for the Alfie Gough Trust. President David Hearnshaw presented a cheque for £2100 to Dean & Sarah Gough to support the work of the Alfie Gought Trust. The funds were raised at this year's successful "Strictly Come Rotary" dance competition, which could not have happened without the tremendous hard work of Rotarian Loraine Bant and dance teacher (& Paul Harris Fellow) Sharon Stevenson from the Telemark School of Dance.